"Deck the halls and let's be jolly"
Having read the earlier book about the midsummer ball I was thrilled to get my gilt-edged invitation card to the house party at the Duke and Duchess of Brockmore's country estate. All the finest unattached men and women joined our cozy party, some at the request of the Duke of Wellington. The lavish dining and seasonal entertainments made for a fine old time. There may have been some SCANDAL AT THE CHRISTMAS BALL. And I daresay more than one romance was kindled. What else is the mistle bough for? 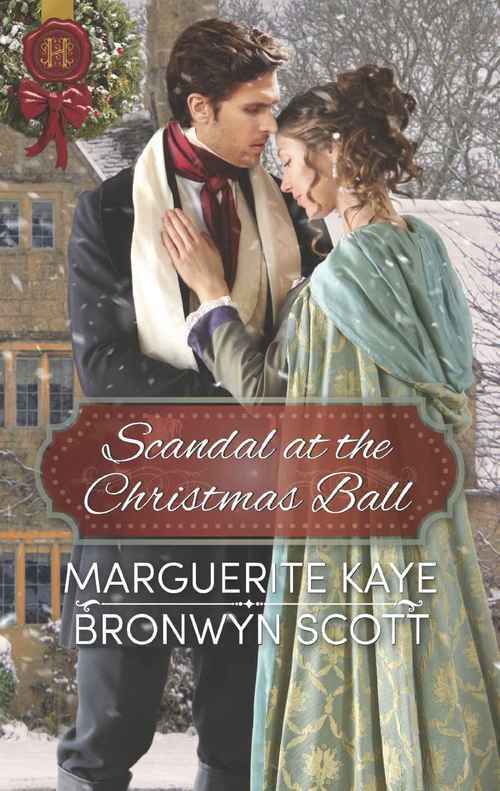 Marguerite Kaye and Bronwyn Scott collaborated on the earlier 'Scandal at the Midsummer Ball' with twin novellas of unlikely romances. Now they return to the same setting for winter fun and games. Skating, singing, kissing, decking the halls, all in the best possible taste. Marguerite Kaye starts us off with A Governess For Christmas which introduces a former soldier, now out of society, seeking a wife to restore his respectability. Drummond MacIntosh is acting under orders from the Iron Duke, as the Duke of Wellington is known, but seems determined to disobey one more time by flirting with a mere governess. Joanna Forsythe, who was falsely accused of theft by an employer, falls fast in love with Drummond, but marrying her would not mend his reputation. Bronwyn Scott continues the account with her saucy miss who is Dancing With The Duke's Heir. Vale Penrith has only recently become next in line to a dukedom after a few family deaths, and he is suddenly a far more eligible bachelor than he was. Lady Viola Hawthorne has no need of money and doesn't wish to marry, so she decides to behave as disgracefully as possible, and by flirting with Vale she can't damage his prospects. While technically the gentle Duchess, her hostess, is the chaperone, the young people find plenty of opportunities to slip off together for kissing and even passion. What would her mama have to say if she knew! These good-hearted adult Regency romances make the most of the setting. I once more admire Marguerite Kaye particularly for developing characters on the margins of high society and whose past actions constrain their freedoms. The contrast is made stronger by Bronwyn Scott's merrier couple, full of the liberties of wealth and position. Which ever suits your mood, SCANDAL AT THE CHRISTMAS BALL is a wonderful Christmas stocking read, well researched and full of life. Christmas. Again. The fourth without his father, without his brother. Vale Penrith drew a deep breath and stepped down from the warm carriage into the bracing cold of winter, the soles of his boots crunching on the crisp, thin layer of newly falling snow. Lumi, the Sami people of Lapland, his latest anthropological study, would call it. Perhaps later it would turn to viti, powdery snow, or if they were less lucky, iljanne�snow that was only a thin layer atop ice. Vale cast a glance towards the grey clouds, sending a prayer skywards. He just had to get through the next twelve days. At least, he wasn�t doing it alone. Vale reached into the carriage, offering a hand to his mother. Margot Penrith descended, a fragile, beautiful snow queen, delicate and elegant, swathed in expensive furs. The look in her pale blue eyes mirrored the thoughts of his mind: they weren�t supposed to be here. Not like this, a broken family of two mourning the loss of their other halves: a beloved husband, an adored brother; a widow and an unlooked-for heir. He�d never thought to be at Brockmore as the heir to his uncle�s legacy, a legacy he felt ill suited to assume. He was a politician by conscience when the occasion demanded it, an anthropologist by choice. He was not a duke. He took his mother�s arm and together they climbed the entry stairs to the imposing double doors already swagged with greenery. An invitation to some, Vale supposed. A note of caution to others like himself. Either way the message of the greenery was the same: Christmas began the moment one passed beyond these doors. Guests could expect the Duke and Duchess of Brockmore to engage the holiday fully. His aunt and uncle did nothing by halves. Inside, the hall was warm. The sound of happy voices drifted from the drawing room along with welcoming scents of spiced tea and fresh baked cakes. The butler had barely taken their coats and furs when Uncle Marcus appeared, silver hair thick, clothes immaculate, his carriage hale and perfect as he strode forward, his arms held out wide, a broad smile on his face, his voice booming in welcome. He took Vale�s mother in a full embrace. �Margot, my dear sister-in-law! You�re here and just in time. We�ll start the greening in an hour or so. Alicia will be so glad you made it. One never knows with the roads this time of year.� He turned to Vale, studying him for a moment, the keen blue Brockmore eyes sweeping him from top to bottom in approval. �My boy, it is good to see you,� he said simply before wrapping him in his arms. Vale hugged him back. For just a minute, he wasn�t the heir, but simply a beloved nephew and this man was not the mighty Brockmore, powerful duke, but his uncle, his father�s older brother, a living link to the man he�d lost. And Vale savoured it. Brockmore toured him about the room. He met the golden, blue-eyed Aubrey Kenelm, heir to the Marquess of Durham, the poised brunette, Lady Anne Lowell, daughter of the Earl of Blackton, whom the Duke introduced with a certain sparkle in his eye. That sparkle sent a frisson of caution through Vale. His uncle was notorious for his matchmaking at these parties. He had no wish to be his uncle�s next project. Vale nodded politely to each woman, careful not to be too polite to Lady Anne, while smiling warmly at her subdued companion, Marianne Pletcher, who by nature of her situation posed no danger to him as a potential match. These were the sorts of people he expected to meet. They were the sorts who ran in his uncle�s circles. Well-bred, well-moneyed people with marital hopes. But, he noted, there was another set of guests that populated the drawing room�in fact, made up the majority of the guests in attendance. There was Miss Rose Burnham, a decidedly pretty girl of good family whose father had fallen on hard times, leaving her with nothing than her looks as a dowry; Matthew Eaton, son of the local baron, who never quite made it up to London but was charming and handsome despite the lack of any other true prospects to offer. With the exception of Kenelm and Lady Anne, these were not the typical guests one usually encountered at Brockmore. Finally, his uncle brought him to a man of later middle years sitting by himself in the corner. Vale watched the man�s tired eyes register with recognition. �Ah, Penrith. The heir.� Vale was coming to hate the title, a constant symbol of all that had transpired in order for that label to come to him. They made small talk briefly before his uncle excused them, his voice quiet at his ear as they moved away. �Silas lost his wife two years ago.� Uncle Marcus squeezed his shoulder, drawing Vale�s gaze. �You are not the only here who mourns.� There was a fleeting sadness in his uncle�s gaze, a reminder that his uncle had lost a brother the same way he�d lost R.J. when his father had died. And yet, one would never know except in these unguarded moments. He envied his uncle that ability to go on. He had not mastered that quality yet. Perhaps he didn�t want to. Perhaps he wanted the clock to stop on the twenty-first of April 1814, since then both his father and R.J. would still be alive. Not just to him, Vale thought as Kenelm moved over to make room for him in their circle at the fireplace. It explained the mix of guests; the lonely widower in the corner, the pretty, desperate debutante, the country-bound baron�s son who for all his potential would never escape the country without a boost from a high-placed mentor. The list went on. His uncle�s gift to them was a chance: a chance to marry well if you were Rose Burnham, a chance to rebuild your life if you were Lord Truesdale; a chance to rise beyond the limits of the countryside on the merits of your own wit if you were Matthew Eaton. A chance to be happy and alive, if you were Vale Penrith and you�d been dead inside already for nearly four years. Applause and cheers went up, filling the drawing room. Beside him, Aubrey Kenelm was good naturedly stripping out of his coat, ready to work. �The ladies will need us for the heavy lifting.� He grinned and nudged Matthew Eaton with his elbow as if they were the best of friends even though they�d only met an hour ago. He grabbed Vale�s arm with his other hand. �Come on. I�ll take the doorways, you and Matthew take the staircase.� Just like that, Vale found himself in charge of draping the banister with no chance to slink off to his room to unpack his books. He had a report to write for the board of the British Museum concerning Lapland and the mysteries of the north. His uncle was right. He�d rather be tucked away in his library where no one could bother him instead of being in the thick of the festivities. But it was too late to turn back now. The museum report would have to wait. The ladder swayed precariously as she adjusted her position. A good sixteen feet below her a crowd of young people greening the hall began to gather around the base of the ladder, intrigued by her antics. On her periphery, she caught sight of a tall figure moving rapidly down the stairs. She felt firmer hands on the ladder a moment later, followed by an even firmer admonition. �Come down at once! Do you want to break your neck?� She didn�t dare look to see who it was below her or she�d lose her nerve. Did the Scold really think she hadn�t already come to the same conclusion? She�d simply chosen to ignore the danger. Playing it cautious didn�t fit her plans. Cautious girls weren�t expelled from house parties. She couldn�t be closer to the chandelier, but the chandelier could be closer to her. Viola�s fingertips could just reach the nearest arm, just enough to give it a push. She set the great chandelier to swaying, a little at first and then more when it gained momentum, but not too much. It was delicate work. She didn�t want the chandelier to mow her down like a wrecking ball. Now, all she had to do was time the in-swing, and� Voila! �Got it!� she exclaimed, hooking the mistletoe on to the dangling crystal drop as the chandelier made its third pass. She let go of the ladder and fell. There was a collective gasp, a moment�s chaos, others rushing forward to steady the ladder and then she was in his arms: strong arms, angry arms. He was not nearly as amused by her finale as everyone else. His blue eyes were thunderous when he set her down. �You little fool! Have you no care? Do you value yourself so cheaply as to throw your life away over a tawdry trick? Or the lives of your fellow guests? You put them at risk as well. What do you suppose happens to them if the ladder falls, or the chandelier crashes without warning?� He did not bother to lower his voice and his tone froze the levity she�d conjured. �Who the hell are you to tell me what I can and cannot do?� She looked him up and down, from steely blue eyes to long legs, her hands on hips in outrage. How dare he publicly reprimand her as if she were a naughty child?. Worse than that, how dare he steal her attention?. The heir. Oh, well done. This was a record even for her. She�d been here less than two hours and she�d managed to give Brockmore�s heir a peek up her skirts. This would not do. She knew a moment of uncharacteristic panic. Her parents, when they arrived, would be furious if they found out. True, she wanted them furious enough to send her home, away from the dangers of matchmaking, but not too furious� if they thought they could use a scandal to compromise someone as enticing as Brockmore�s heir to the altar, her plans would have backfired in the extreme. The altar was what she was trying to avoid. Diversion! She needed something to top the ladder escapade, something everyone would talk about instead. She flashed a challenge at tall, imposing Penrith with his angry eyes and strong arms before turning to the others. �We�re standing under a mistletoe ball and you all know what that means!� Viola pulled the nearest young man to her, Matthew Eaton, and kissed him hard on the mouth, a glorious, open-mouthed kiss that lingered long enough for everyone to take note. This was no chaste peck on the cheek, or a polite, dry buss on the lips. Viola stepped back and raised her arms in pronouncement. �The first kiss of Christmas!� The guests whooped with delight. Just like that, she had the crowd back. She tossed Penrith a victorious grin over her shoulder, but he was already gone, back up the stairs to fasten the last of the bows on the garland at maddeningly even, precise intervals, thanks, no doubt, to the measuring stick he probably carried in his�head.